SANTORINI is currently the Greek island of choice among Hollywood celebrities and chart-topping pop stars. Angelina Jolie reportedly bought a house with her ex-husband Brad Pitt on the island after falling in love with Santorini during the filming of Tomb Raider. Justin Bieber recorded a music video there recently. Even the Kardashians took a break from swanning around LA to jet across the Atlantic and film an episode of their reality television show on the island. So what better honeymoon destination could you ask for if you are looking for a mix of glamour and relaxation after months of stressful wedding preparation? And that's exactly where my wife and I went, to take a break from reality and pretend we could afford to live it up like Brad and Angelina on a volcanic caldera in the Aegean Sea. Getting to Santorini, or even Greece for that matter, during the off-season is not straightforward. There are no daily direct flights to Athens and a stopover is necessary along the way. So to break up the air travel we decided to stay four nights in the Greek capital to take in the sites and sounds the historic city. We checked into the five-star Royal Olympic Hotel which is one of the most luxurious and central hotels in Athens. The hotel lobby alone is a masterclass in stately opulence. Large replica statues of Greek goddesses nestle in between classic leather sofas and giant vases. If it is a business trip destination you're after, the hotel has 18 recently refurbished meeting rooms and each is renovated according to a theme nodding to the city's rich history. You are doing yourself a disservice if you don't book into one of the hotel's panoramic rooms at the front of the building. Luxurious double rooms feature electronic curtains which can be drawn with the flick of a switch to reveal spectacular views of the Temple of Olympian Zeus and the Arch of Hadrian. Even more awe-inspiring are the views of the pinnacle of Greek architect - the Acropolis - from the Royal Olympic Hotel's rooftop garden restaurant. The view is only enhanced by the massive spread laid on by staff for the buffet breakfast, which features local delicacies and international favourites. The rooftop restaurant is the perfect setting for a candle-lit dinner where you can tuck into high-end Greek dishes as the floodlit Acropolis looms over on the hotel. The hotel also has a pool bar and lounge which are the perfect settings for cocktails when the city heat gets too much. Of course, the Acropolis should not only be enjoyed from the distance and a trek up the historic hilltop is an essential pilgrimage for any tourist. Signing up to one of the local tours is a good idea as the level of signage on the ancient citadel is limited. Another must-see site is the Panathenaic Stadium, which is less than 15 minutes' walk from the hotel. The stadium is built entirely of marble and was the setting of the first modern Olympic Games in 1896. The city is full of restaurants and cafes where a well-earned beer and local tapas can be devoured to break up the sightseeing. Every corner of the Plaka area of the city serves up fresh salads, fish and meats which can be washed down with a cold Mythos beer. The streets leading to Syntagma Square are also littered with restaurants of all price ranges. Fashion bargains are available a short walk from the square at the Monastiraki flea market, but, as always, beware of pickpockets. 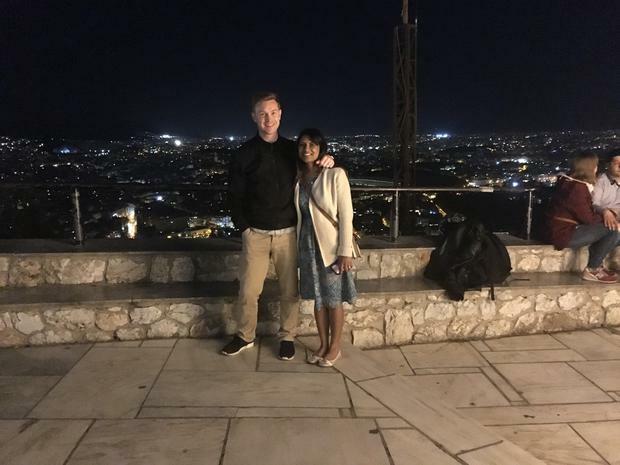 After four nights in Athens, we took the 30-minute flight to Santorini where we were collected from the airport by a representative from the Athina Luxury Suites company. After a short drive we arrived at the boutique clifftop resort in Santorini's capital Fira. The first thing you notice in Fira are the steps. There are hundreds of them, winding up and down between the hotels and guesthouses sitting on the caldera cliff face. The second thing you notice is the donkey dung. Due to the lack of access for cars, donkeys are used as taxis for tourists and transport for construction workers. Athina Luxury Suites is a small family-run business but the resort rolls out the sort of luxury you would expect from an international hotel company. Athina's staff (with particular mention going to key members Sarah, Lulu and Christopher, and of course the boss Panos) go above and beyond to ensure you are enjoying your stay. If you're looking for guidance on restaurants or attractions, the Athina staff won't steer you wrong. For the first three nights we stayed in the honeymoon suite, which not only has a private jacuzzi on the balcony but also a steam room in the bedroom. A complementary bottle of Champagne sitting in an ice bucket was popped soon after our arrival. After three nights in the honeymoon suite we were promoted to the royal suite. This luxury suite is a two-bedroom, three-bathroom villa, complete with marble staircase and heated balcony jacuzzi big enough to fit 10 people. There are three flat screen televisions, a full-size marble statue of the Greek goddess Athena, and enough room to host a dinner party for a dozen guests. Fresh breakfast is served on the balcony every morning and the choices are endless. You can also have lunch or drinks by the pool in the evenings to watch the sunsets. Santorini is not cheap and the average price of dinner is not far off what you might pay in Dublin. Seafood is the local speciality but most restaurants also serve up traditional Greek favourites such as souvlaki and gyros. On the main square there are some great little restaurants with plenty of outdoor seating. Ellinikon is worth checking out for the seabream alone. There are also some lively fast-food joints. A little further up the road, the recently renovated Kokkalo provides a modern Greek twist on the typical US steakhouse restaurant. Falafel Land, which is tucked behind the square, is also a hidden gem for ideally-priced grub. Outside Fira, Mario's fish restaurant, which is located near the airport, served up the best meal of the trip. Nightlife doesn't end after dinner in Fira, it only gets started. In early April, the party scene was only kicking off but there was a smattering of nightclubs and pubs luring in tourists with offers of cheap cocktails. The most popular is the Two Brothers Bar, where punters are offered free shots if they allow the barmen to whack them over the head with a stick. They give you a helmet to wear but they don't hold back when they hit you. Still, a free shot is a free shot. Locally brewed craft beer Crazy Donkey is difficult to find but if you do come across it, you should definitely try a bottle. To really see Santorini, you need to rent a car. The island is small but public transport isn't great and most sights are only 20 minutes' drive away. You can zip around the coastal roads taking in views of the cliffs and the other volcanic islands sitting in the Aegean Sea. It is worth driving south to Akrotiri to see the archaeological site of the first city on the island which dates back to 3,000BC. The nearby red beach is also worth a look. There's also a tomato factory museum if that's your thing. The most northern tip of the island is the town of Oia where holidaymakers gather every evening to watch the bright red Greek sun disappear into the Aegean Sea. An all-day boat tour - drink and barbecue included - are also a popular way to see the island's spectacular coastline. With the sun beating down from the heavens there really is no better way to see Santorini. The catamaran cruises also end by harbouring in Oia to watch the sunset. A week is the perfect amount of time to spend on this beautiful island, giving you a chance to lie on the beach or by the pool, as well as see the many sights. All in all, Santorini is the perfect honeymoon destination. Take an all-day catamaran cruise to Santorini’s most northern town, Oia, or drive, and find a perch along the historic walls to watch a spectacular sunset on the Aegean Sea. The first modern Olympic stadium can sometimes be overlooked by tourists but the sheer vastness of the entirely marble sports ground and its fascinating museum make it a must-see. This five-star hotel is in the centre of Athens and a short walk from all the main attractions. Rooms range from around €180 per night for an executive room, to €625 for a suite. Athenian panorama rooms start from €345 per night. This five-star boutique hotel is on the caldera cliff-face in Santorini’s capital Fira. Summer rates for junior suites start from €427 per night. The honeymoon suite is €769 per night and the royal suite costs around €1,282 during peak season. Sorcha O'Connor She tied the knot in September and now Hannah Devane and husband Nemanja Vukanic have flown to Africa for a honeymoon she has described as "out of this world". Karen Birney, THEVOW.ie Disembarking from our bus after a surprisingly comfortable three hour ride from Marrakech, our first thought is to head straight for the sea.